The city is continuing its push to move older teens out of the Nicholas Scoppetta Children's Center at 492 First Ave., but has backed off giving a firm deadline. 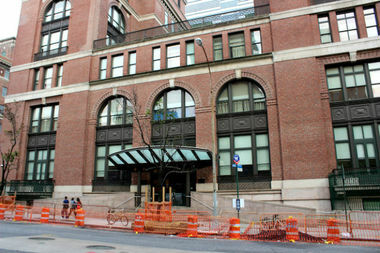 KIPS BAY — The Administration for Children’s Services has begun placing some older teens directly in foster homes rather than in its troubled reception shelter in Kips Bay as part of a push to keep older children out of that facility, an agency spokesman said. Last month, ACS launched its “host home” program, part of the agency's effort to place teens in homes and facilities more suited for their needs instead of the Nicholas Scoppetta Children's Center, which was at the center of controversy in 2014 after DNAinfo reported that teens had repeatedly gone missing amid an environment of rampant neglect. Since then, the agency has focused on providing alternative reception centers for older teens, including two facilities in Brooklyn with 12 and 10 beds respectively, as well as a facility in Staten Island with eight beds that is expected to open within a month, according to ACS Associate Commissioner Tim Roche. The "host home" program will provide an additional 30 beds in specially trained foster homes for children ages 14 and up, as part of the agency’s goal to dedicate services at the Children’s Center at 492 First Ave. entirely to children from birth to age 13, Roche said. There are currently 11 foster homes operating within the program, including one in The Bronx, according to an ACS spokeswoman, who would not immediately specify where the others were located. The goal is to open 15 homes total, she said. Each home will be able to accommodate two teens at a time, and they are intended to stay for a maximum of 30 days before they're moved to a more permanent home, according to the spokeswoman. The homes are being coordinated by foster-care provider the Children’s Aid Society through a $4.4 million contract the city awarded the group in June, records show. Teens placed in the foster homes will pair with a social worker who will spend 15 hours a week helping them get to school, do weekend activities and plan for the “next best place” for the child, whether that’s their own home or a more permanent foster option, Roche said. The social worker would then stay in touch with the child for up to six months to make sure the child has a stable transition, Roche said. In the early stages of the program, ACS is giving priority to teens with a high possibility of reunification with their families, as well as to "persons in need of supervision" who would benefit from working closely with a caseworker assigned to them, a spokeswoman said. It is the agency’s goal to be able to place all incoming children 14 and up in a youth reception center or a host home, while keeping the Children’s Center dedicated to younger children, Roche said. The 55-bed Children’s Center, which opened in 2001, has long functioned as the city’s only landing site for children entering the foster care system. But after DNAinfo revealed the facility had filed more than 1,600 reports of missing children over a 13-month period amid allegations of crowded conditions and neglect, the city announced plans to move teens out of the facility. When ACS announced plans in December 2014 to begin moving teens out of the Children’s Center, a spokesman gave a target date of summer 2015 for when they would all be relocated. More than a year after that deadline, teens continue to stay at the center — sometimes for extended periods, Roche said — and officials have backed off giving a hard deadline. “I don’t know that we can give an exact timeline,” he said.